Location: Santa Fe de Mondujar, Andalucia, Spain. Grid Reference: 36.96° N, 2.5° W.
Los Millares: (Neolithic Fortified Settlement). Los Millares is the largest known European fortified Neolithic settlement, dated c. 3,200-2,300 BC. The site includes a settlement and a cemetery with over 80 megalithic tombs. Three walls and an inner citadel with an elaborate fortified entrance make up part of extensive fortifications at Los Millares. Thirteen nearly circular enclosures were forts protecting it. Within the three walls are 80 passage graves. Los Millares was constructed in three phases, each phase increasing the level of fortification. The fortification is not unique to the Mediterranean area of the 3rd millennium; other sites with bastions and defensive towers include the sites of Jericho, Ai, and Aral (in Palestine) and Lebous, Boussargues and Campe of Laures (in France). It consists of a settlement, guarded by numerous outlying forts and a cemetery of passage tombs and covers around 5 acres. 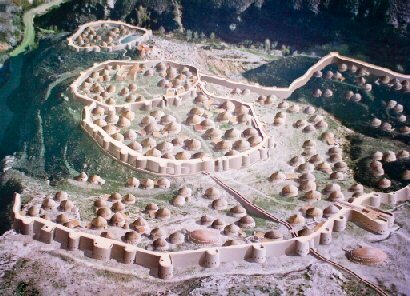 The settlement itself was surrounded by three concentric walls with four bastions; radiocarbon dating has established that one wall collapsed and was rebuilt around 3,025 BC. A cluster of simple dwellings lay inside the walls as well as one large building containing evidence of copper smelting. Finally, the fortified citadel at the very top of the spur has only been investigated so far by means of various pilot trenches, which have revealed walls up to six metres thick, confirming the great importance of the structure. Within its grounds there is a deep hollow, which Siret concluded must be a water cistern but so far has not been excavated. Los Millares was discovered in 1891 during the course of the construction of a railway and was first excavated by Luis Siret in the succeeding years. Los Millares was later excavated from 1978-1995 by Antonio Arribas and Fernando Molina at the University of Granada, and analysis continues on the massive amounts of information collected. Over eighty megalithic tombs are visible outside the settlement. The majority are of the type mentioned above, but tombs without corbelled roofs also exist. The chronology of tomb construction and use is unclear, but analysis of tomb forms, sizes, numbers of burials, contents, and distributions suggests that the dead were selected for interment and that social ranking had emerged, with higher-ranked groups being buried in tombs located close to the settlement. Similar Tholos Tombs are common in Mycanaean remains, and a connection is commonly suggested. They are also present at other places in Spain, noticeably at the Cueva de Viera, which sits beside the great Cueva de Menga passage mound. Holed stones are also a common feature of dolmens in the Caucasus region of Russia where hundreds are visible. The entrances were divided by large sheets of slate which were punched through and rounded off to make the entrances we see today. 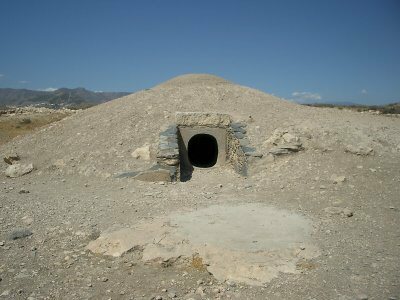 The chambers of the Tholos were lined with vertical slabs of slate, often painted red, sometimes with small niches present (used for the burial of children). The graves were finally covered over with conical mounds of earth and stones. Many were given an outer skirting of slabs or masonry to strengthen the structure. Almost all the tombs were orientated east of southeast, except for a small group of seven mounds were orientated southwest. The presence of such great quantities of mineral resources in the region is likely to be part of the reason for the existence of Los Millares in the first place. The parallels with the Minoans continues in the addition of arsenic as an antioxidant to their copper products. Arsenic is readily available in the local region of Sierra de Gador. Among the buildings dedicated to specialised activities, two areas have been identified as having once housed metallurgical workshops. While along the northern stretch of the outer wall there are several square and round buildings dedicated to this, the best preserved worksghop is situated in a large rexctangular building attached to the inner facade of the third line of fortification. Of considerable size, about 8m long by 6.5m wide, it was built with a solid masonry technique, with a door opening to the east. Inside are the ermains of three structures: a mass of 1.3m in diameter with fragments of copper ore, a furnace deliniated by a ring of clay with a depression at its centre to put the pot furnaces, and a small structure with slabs of slate in its northeast corner. It is suggested that this building was never roofed as there are no post-holes present. Los Millares: Gallery of Images. 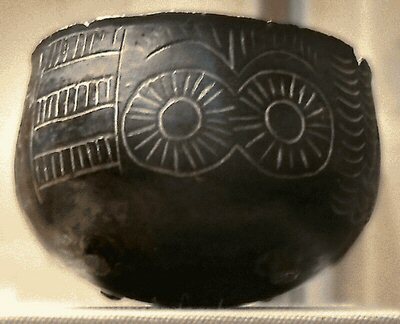 Funerary bowl from Los Millares. Evidence of Trepanation at Los Millhares.